to market our products and services to you by providing you with information about our products, promotions, services and website. Each email you receive from HolyLand-Gifts.com will give you the opportunity to cancel or “opt-out” of our mailing list. A personal email from us is normally sent to notify you of your product shipment and date to expect your gift item(s). Although the emails we send are not normally caught in email spam filters, you should check your spam folder if you are expecting a message from us and do not see it arrive. Contact us if you have a question regarding this policy. 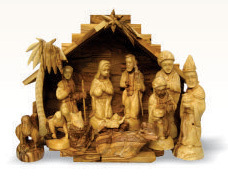 HolyLand-Gifts.com DOES NOT provide your information to any THIRD PARTIES or anyone else; except when you place an order, we utilize PayPal as a secure payment gateway (credit card or payment authorization). PayPal uses your information ONLY for payment processing. Our connection to social media (FaceBook and Twitter) are for information and marketing purposes only. Like us on Facebook to stay up to date on the most recent news about our products and the Christian artisans who make them.